It has been a wait, but after announcing that I would be making video tutorials for the Mandala Madness CAL designed by Helen Shrimpton we are ready to start. From now till the summer holiday I will be releasing a video each week, and today we start with week 1. All videos for Mandala Madness will be available through my YouTube channel, but you can also follow them right here on my blog where all videos are grouped on this dedicated video page. 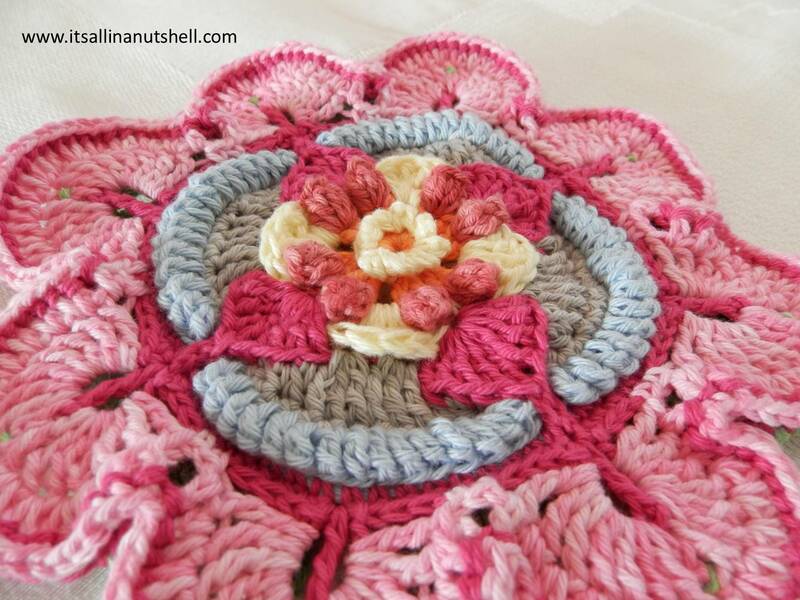 In the video for week 1 I show you step-by-step how to make the center flower of the mandala. I use two yarns for my mandala, both by Scheepjes. I used Scheepjes Sunkissed and Scheepjes Cotton 8, bot good quality sport weight cotton yarns and work both yarns with a 3mm (D-3) hook. There are yarn packs available for this CAL in Scheepjes Color Crafter, Scheepjes Stone Washed XL and Scheepjes Merino Soft. Here a list of the colors I used for week 1. I love the photos with the pinks, the interior section (first 6 rows) reminds me of a lady slipper plant! How do you join this CAL? I can see your video, but can’t find a link to join or purchase this pattern? Thank you. I will go and join now. is there a Written Pattern as well as a video. is er deze keer ook een Nederlandse vertaling van dit prachtige patroon?? What amount of each yarn did you use for this project please? I woukd like to do a mandala using these same colours. Thank you. I have not completed the project, so I have no idea on final yarn amounts just yet. I am also using more colors in the following parts. I can not say anything sensible about my colors and yarn at the moment. Do you think the Scheepjes new Whirl would work for this Mandala Esther??? Thank you. I’ll keep you posted….a Slice o Chery pie it is then!! !